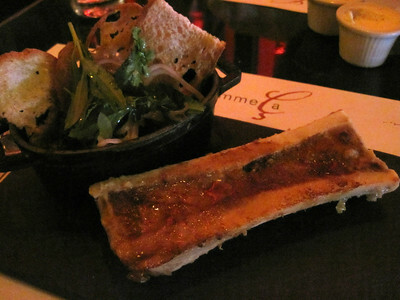 Our fourth Restaurant Week meal was at Comme Ca inside the Cosmo. The restaurant was fairly busy Thursday evening about 7 o'clock. Our waiter was very attentive. Too attentive actually. The breads to get you started are fresh and warm. 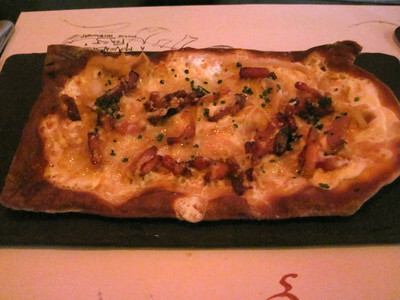 For starters we had Roasted bone marrow and tarte flambe; smoked bacon, caramelized onion. The tarte flambe was tasty; baked crisp and full of tang from the cheese, smoke from the bacon and sweetness from the onion. I've never had bone marrow, nor oxtail jam. I was excited to try it especially after all the raves I've seen about this particular dish. It's $18 on the regular menu and I didn't see a single complaint about the price so I figured it must be good. I have nothing to compare it to, but I didn't appreciate it. The oxtail jam taste like pot roast and the bone marrow had no distictive flavor. I couldn't say if I liked it or not, I couldn't taste it. All I could think was that it looked like the big bones we'd get in a doggy bag when I'd dine out with my parents as a kid. Our pups loved to chew on bones. So, yes, I'm saying this dish seemed like dog treat. 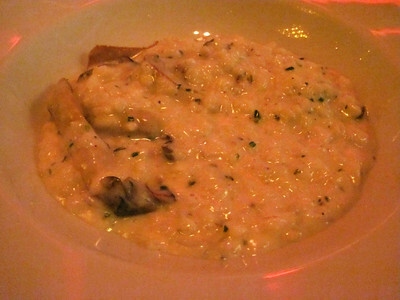 Entrees were steamed mussels; spicy tomato, andouille sausage and simple risotto with wild mushrooms. The risotto was good, but not great. It was a bit grainy and we've been spoiled by truffles. The steamed mussels were very good, tender and in a nice broth. 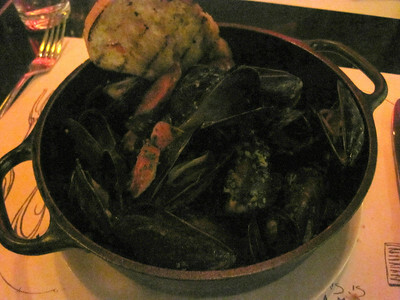 I really liked the meaty spicy andouille that accompanied the mussels. Dessert was decadent and wonderful the salted caramel mousse; dark chocolate ice cream, cocoa nib crumble did not disappoint. 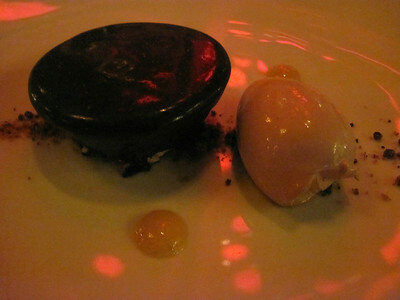 I was terribly disappointed with desserts at Comme Ca on a previous visit. Judging by this restaurant week dessert, they have really stepped up their game and that first visit has been long forgotten.